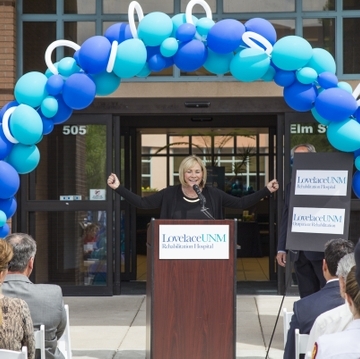 Lovelace Health System and UNM Medical Group, Inc., have partnered to provide expanded rehabilitation services for patients recovering from stroke, brain injury and musculoskeletal disorders. 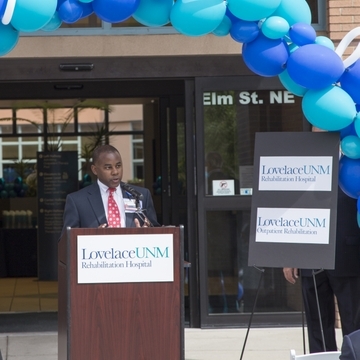 The newly opened Lovelace UNM Rehabilitation Hospital was celebrated at a May 31 ribbon cutting ceremony. 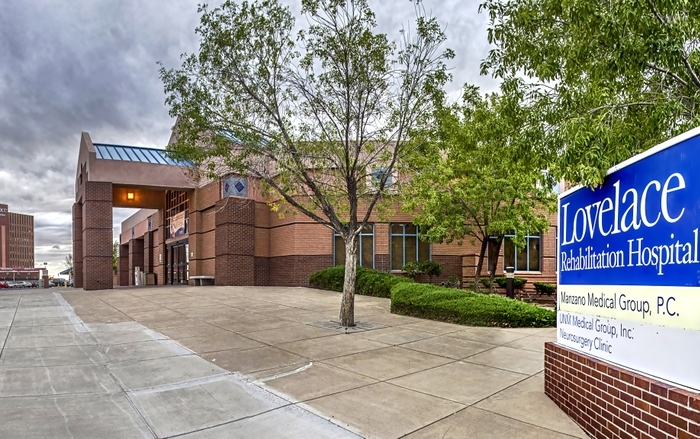 In addition, UNM’s academic and educational expertise will play a critical role as plans are underway to launch a new residency program in 2018 in Physical Medicine and Rehabilitation, through the UNM School of Medicine. 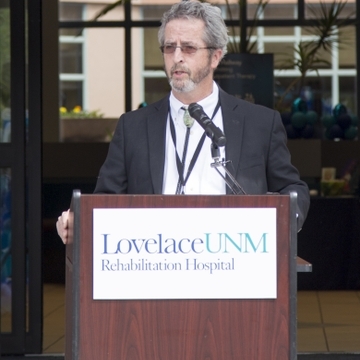 The first of its kind in New Mexico, the physical rehabilitation residency program will be based at the Lovelace UNM Rehabilitation Hospital and will help meet the expanding need for rehabilitation providers in New Mexico. Training the state’s physicians to become rehabilitation specialists is an important component of the partnership. 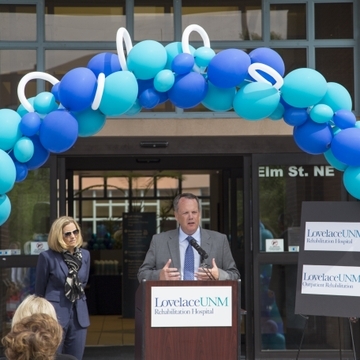 “This opportunity allows us to expand our academic mission of providing innovative programs and research opportunities that will lead to improved care for New Mexicans,” said Michael Richards, MD, MPA, vice chancellor Clinical Affairs. 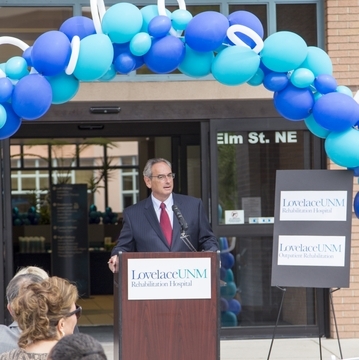 The Lovelace UNM Rehabilitation Hospital is accredited by the Commission on Accreditation of Rehabilitation Facilities. In addition to Jones’ leadership, John Henry Sloan, MD, will continue as chief medical officer. 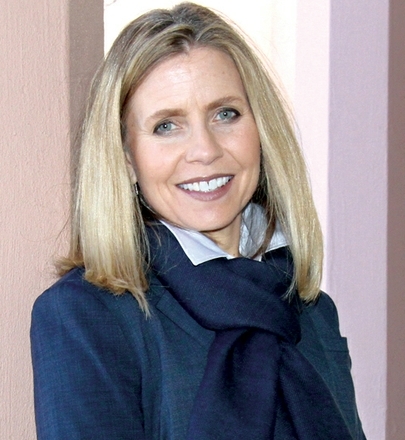 UNM will designate a chief academic officer to oversee the residency program. 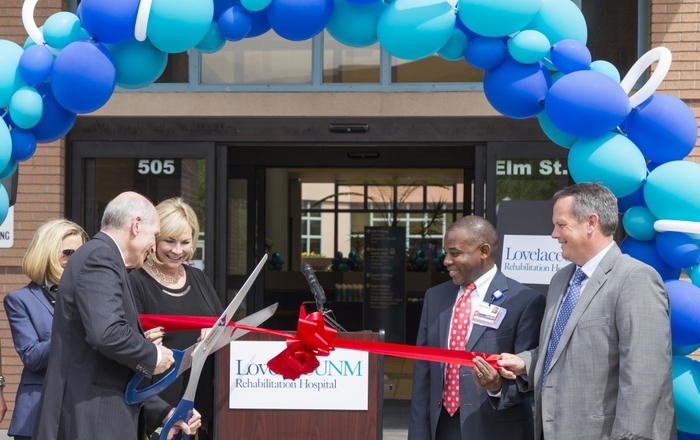 A newly created 6-member board will govern the hospital; three members will be appointed by Lovelace and three by UNM. Categories: UNM Health System, Patient Care, School of Medicine, Community, UNM Medical Group, Inc.
Michael Richards, MD, MPA, vice chancellor Clinical Affairs and Jill C. Klar, CEO, UNM Medical Group, Inc.
UNM Medical Group Chief Operations Officer Jill Klar has been appointed interim chief executive officer to replace departing CEO Anthony Masciotra.